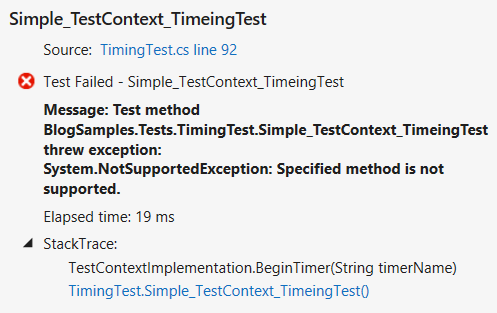 This post outlines my (with help of others) solution to keeping my unit tests working in the absence of TestContext.BeginTimer() and TestContext.EndTimer(). These seem to be missing in Visual Studio 2012 and I can’t find any posts… so I assume no one else uses this pattern. What? A System.NotSupportedException: Specified method is not supported? It worked fine in previous versions of Visual Studio. As I said, I have lots of tests like this. I routinely used these two methods to look at performance between alternative approaches. When I upgraded to Visual Studio 2012 I got a Method Not Supported exception. So I wondered if I should update all my tests to instead use a System.Diagnostics.Stopwatch, or if I should develop a derived class from TestContext and implemented the methods. I chose the later. The post “How do I derive from TestContext class and implement from base members” provided the information I needed to get started. While snotman’s motivations were different, a twist on his approach was just what I needed to keep this change short. Now I’m not sure what would happen if you have complicated cases with overlapping timers. However, for my unit tests this met my needs. So I’ll be writing this, now that I’ve proved it in some simple tests, to help me get past the strange missing capability in Visual Studio 2012. I hope this helps others that might be facing this issue. This entry was posted on Saturday, November 17th, 2012 at 12:00 am and is filed under Technology. You can follow any responses to this entry through the RSS 2.0 feed. You can leave a response, or trackback from your own site. I think you must have something to do with either configuration or installation. I just tested the same thing and it works for me. I’m on Visual Studio 2012 installed on Windows 8 Pro x64. You’re on VS 2012? After project is upgraded, old dll references are used. I had exactly the same issues. Make sure that references for UnitTestFramework and LoadTestFramework point to IDE/PublicAssemblies (not ReferenceAssemblies). Thanks so much! I’ve not had a chance to try it yet, but that makes a lot of sense. And that explains why some posters here didn’t have the issue. Some were upgrading as I was, others (without the issue) weren’t. I hope your comment helps others too. This approach is working on my installation of VS2012, and allows me to have the timers in my unit test and to run it as a single user without putting it in a load test. Removing the functionality in CS 2012 was NOT a swift move by Microsoft. I have found some cases where a timer in unit tests still does not work in VS 2013, but then sometimes it will work in 2013. In any case, in VS 2012, “unit test timers” are consistently broken but the above line of code provides a workaround. I added the public reference, but still get the not-supported exception. I created a new test project and compare the new to my existing. There are definitely reference and build differences. From my limited knowledge of MSBuild, It looks like running the tests in VS2010 will use the correct assembly. 51 queries in 0.301 seconds.